How can I apply best practices to maximize SmartOffice? Whether you're new to SmartOffice or you want to strengthen your skills to grow your business, these best practices will keep you on the path to success! Your book of business is the lifeblood of your organization, so ensuring it is protected from unauthorized access is critical. protect your data from being accessed, altered or extracted without your authorization. Don't put it off. Take a few minutes to browse the materials below and start protecting your data today! Do you need to make certain records visible to some users and invisible to others? For example, you might want to "hide" one advisor’s contacts from other advisors while still allowing management or an assistant to view those same contacts. To set up your data this way, you need to turn on Office Security. Without Office Security, all contacts are visible to all users. If that's OK with you, skip to Assign User Rights below. Attend our free, live Office Settings and Administration training class for an informative, interactive session covering office security and user rights concepts. User Groups can contain members of a specific department or functional area (e.g., new business, marketing, front office, etc.). Creating user groups makes it much easier to assign records to multiple users at the same time. As an alternative to user groups, many smaller offices prefer the ease of User Proxies. A user who proxies for another user can access the records assigned to that user. For example, a new-business clerk who works for multiple producers can proxy for each of those producers. The clerk will then have access to all records assigned to those producers. Thanks to this proxy relationship, you don't have to assign records to the clerk manually. The clerk's access to data is updated automatically based on which records are currently assigned to the producers. *Users designated as Super Users bypass all assignments and proxies. They can see all non-private records. In SmartOffice, every user is assigned certain user rights that control what the user can do in the system. Administrator Functions – Assign this user right only to your designated SmartOffice administrator(s), as this right controls the keys to the kingdom. Data Export – This user right allows users to export SmartOffice data to an Excel spreadsheet. To protect against unauthorized dissemination of your database, assign this right only to users who absolutely need it. List and Page Layout Customization –These user rights are available as office-level and user-level rights. Assign them as user-level rights to prevent a user from accidentally changing list and page layouts for everyone in the office. Drop-Down Choice Customization – Assign this user right only to SmartOffice administrators so that they can enforce data consistency (maintaining consistent data is covered later in this section). Mass Functions – The Mass Area Code Change, Mass Deletion, Mass Modification, Mass Deletion Requirements, Mass Deletion Commission Records, and Mass Assignments rights should be restricted for most users to prevent accidental changes that could affect a large number of records. Export Contacts to Another Office – Limit the assignment of this user right to prevent users from sending data to another SmartOffice user in another office. Merge Contacts / Advisor Merge – Provide these user rights only to your SmartOffice administrator(s). Your SmartOffice administrator should be a staff member who has a good grasp of technology and a vested interest in the success of SmartOffice. The administrator will champion the effective use of SmartOffice in your business and will be the point of contact for users. The administrator will configure SmartOffice, create users, assign appropriate user rights, help coordinate training efforts, and act as a liaison between users and Ebix for support issues. Keep in mind that this role can be shared by two people. Clearly defined goals provide direction and focus to you and your team and play a pivotal role in measuring success. Take the time to develop a clear vision of what you would like to achieve using SmartOffice, and then identify the goals that will help you get there. SmartOffice is a means to an end, not an end in itself. The best approach is to think about your business needs and goals first, and then adapt the technology to help achieve those goals. Identify three to five production, service, and/or back office goals (or more if you’re ambitious!). Each goal should be well-defined, quantifiable, attainable, and should have an associated deadline or time period. Segment your client list by identifying A, B, and C clients by June 30. Increase the number of customer “touch points” by 50% during the next 12 months. Meet a certain production level by the end of the year. Send out a quarterly newsletter. Articulate what you expect from each individual and/or department, and ensure that everyone knows how their contributions impact the entire organization. Changing technology is a catalyst for revisiting workflows or job roles. The “we've always done it this way” attitude can derail progress. Mitigate that risk by promoting change. Offer incentives—gift certificates, paid time off, company-sponsored lunches, recognition in a company newsletter, etc.—to motivate individuals or teams to find new ways to improve efficiency or increase revenue. Schedule weekly, monthly, or quarterly meetings to ensure your team stays on track to achieve their goals. Foster a collaborative environment that promotes the sharing and discussion of ideas and solutions. Data entered into SmartOffice through a conversion, import, sync, or manual process can be inconsistent, incomplete, or redundant. Data does not have to be perfect, but clean data leads to increased adoption of SmartOffice, improved efficiency, and more accurate reporting. The old adage “garbage in, garbage out” holds true here. Ensuring that information is added to the database accurately and consistently pays off in the long run. *If your data needs work, consider hiring a part time intern to help with data cleanup. Keep workstations up to date with the latest software updates and service packs. This helps to ensure that all programs, including SmartOffice, continue to work the way you expect them to. Avoid bleeding-edge hardware and software. It takes most software companies several months to develop and test new products. Using these products too soon can destabilize your computing environment. As the old saying goes, Rome wasn't built in a day. The most successful SmartOffice users adopt a phased approach to their learning. Allocate time for training on a regular basis, whether that training takes place in an individual or group setting. 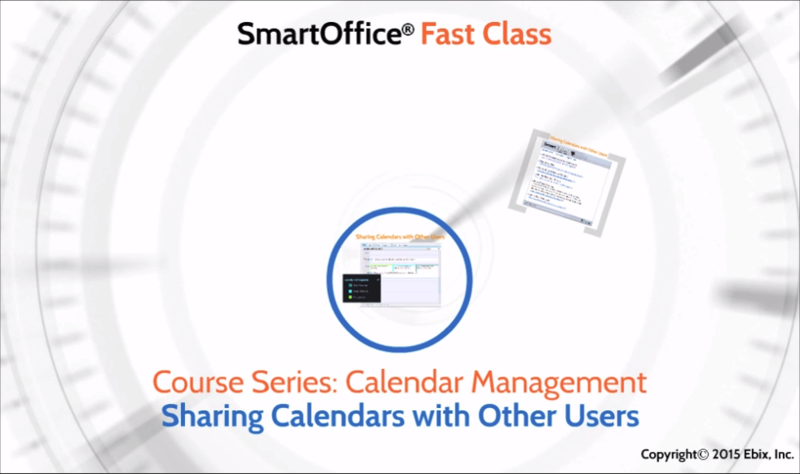 Make SmartOffice an agenda item in staff meetings. Sponsor SmartOffice “lunch and learns” where staff members conduct training in their particular areas of expertise. Every two weeks, set aside an hour at the beginning or end of the day to allow staff to watch the latest Fast Class video and practice the concepts presented. Schedule time with one of Ebix’s SmartOffice experts at CRMtrainingcalendar@ebix.com.